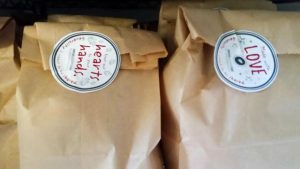 In the Fall Maple Leaf Lutheran Church in Meadowbrook plans a 100 sack lunch effort as part of their ‘Gods Work, Our Hands’ campaign. Support from Thrivent Financial provides the fixin’s and the church provides the ‘hands’. This concerted effort benefits the SHARE Shelter residents at Maple Leaf. The program has been at the church since 1996. 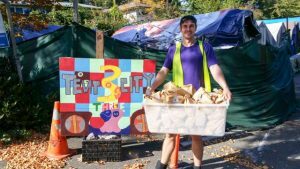 This year the opportunity to support Tent City 3 also made itself available as residents of TC3 were at the St George Church site in Lake City on NE 125th. Residents will be sited there until December when they will move to the University of Washington. 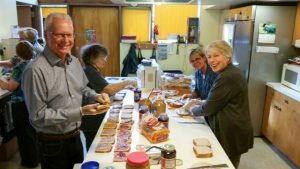 If your organization would like to support the residents at Maple Leaf Lutheran Church, give a holler and lets make it happen! Greater Seattle Cares organizes support for the Tent City/ Outdoor encampments.